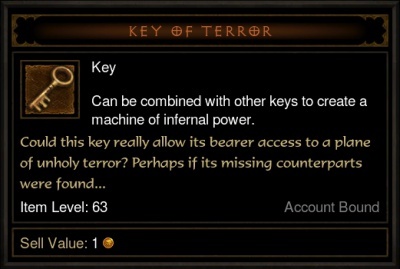 The Key of Terror is a special item dropped by Xah'Rith the Keywarden, a Unique monster who can be found somewhere on the Stonefort level in Act Three. On Inferno difficulty this monster *may* drop the Key of Hate; one of the three keys required to create the Portal Device, which is required to complete the Infernal Machine event. Obtain the three keys and the Infernal Machine plan for the Blacksmith. Craft three keys, one of each, into the Portal Device. The Realm of Discord. Battle King Leoric and Maghda for a chance to obtain the Writhing Spine. The Realm of Chaos. Battle Ghom and Rakanoth for a chance to obtain the Devil's Fang. The Realm of Turmoil. Battle Siege Breaker and Zoltun Kulle for a chance to obtain the Vengeful Eye. Take the three demonic organs to Covetous Shen and craft them into a Hellfire Ring. Note that steps 1-3 must be repeated multiple times, since you must create at least three red portals to obtain all three demonic organs. Furthermore, unless you are playing on Monster Power 10, the keywardens do not always drop keys and the uber bosses do not always drop the demonic organs. This page was last edited on 8 April 2015, at 12:07.